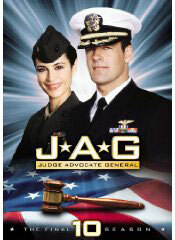 I never watched the military procedural drama J.A.G. during its 10-year run simply because I busy with studies during the early seasons and other shows intrigued me more during the program’s later seasons; however, the idea of Navy attorneys litigating cases according to military law seemed to be an interesting concept. Additionally, series stars David James Elliott as Harm and Catherine Bell as his female colleague Mac seemed appealing. I mention all this because I suspect that this unfamiliarity with the program was a factor in my not enjoying the recently released DVD set of the 2004-05 final season of this show. I confess as well that I watched only 4 of the 22 episodes because I found them incredibly dull and it did not seem that the rest of the episodes picked up the pace. I wonder as well if I would have liked the series better if the DVD set had included a retrospective on it that depicted the relationships of the characters and significant moments from the program. I know that I would have followed the first episode, which resolved a ninth season cliffhanger, better if that episode had begun with a recap. The same is true regarding Harm’s support of teen-age girl with an alcoholic father; I did not pick up on how Harm came to care for her. My biggest disappointment was that it seemed that the stars and the guests lacked any spark; they were all generally very polite and deadpan despite some apparent strong personal attraction, animosity, or simply being on opposite sides of the legal dispute of the week; I recognize that the military requires strong discipline, but good television requires more expression of emotions than I witnessed. Further, as a non-practicing attorney, I had hoped to learn more about the Uniform Code of Military Justice that provided the law that governed in the court where the accused individuals were tried. It did not seem very different than the law that I learned and that is depicted on several series each week. Showing contrasts between military and civilian law and making arguments to at least apply the principles of civilian law would have made for better television. Additionally, the very timely stories that included several plots that revolved around aspects of the war on terror did not raise any particularly interesting legal issues under either military or civilian law. The conflict just seemed to revolve around proving guilt based on the evidence that was collected, rather than how that evidence could be presented best in a courtroom or an ambush in the courtroom could be overcome. My favorite of the four episodes that I watched involved a retrial of a sailor who had been in jail for more than 20 years for killing a transvestite prostitute who the sailor admitted to assaulting but denied killing. The outcome was predictable but addressed the interesting legal issue of the admissibility of evidence that might have been altered. That episode also addressed advancements in forensic science that had occurred over the past 20 years. To provide my own recap, the DVD set of the 10th season will be a treat for fans of the show but is not intriguing enough to expand its audience. I would like fans of J.A.G. to e-mail me at tvdvdguy@gmail.com to let me know if I am missing something. A one-hour, dramatic series JAG (military terminology for Judge Advocate General) is an adventure drama about an elite legal wing of officers trained as lawyers who investigate, prosecute and defend those accused of crimes in the military, including murder, treason and terrorism. A Navy Commander ace pilot turned lawyer Harmon “Harm” Rabb, Jr. (David James Elliott) and by-the-book Marine Lieutenant Colonel Sarah “Mac” MacKenzie (Catherine Bell) find themselves clashing as they traverse the globe together to search for and discover the truth.